Zoom! Teeth Whitening in with your dentist in Manalapan. If you are looking for a Dentist in the East Brunswick, NJ, Manalapan, NJ, Monroe, NJ, Englishtown, NJ, Morganville, NJ, Marlboro, NJ, Freehold, NJ, Old Bridge, NJ areas, we welcome you to our cutting edge prosthodontic practice. As many of you know, for years Prosthodontist, Dr. James Courey has been apprehensive about tooth whitening with "lights" because of its drying effects on the teeth. However, we are please to now provide our patients with latest in safe, whitening technology. Zoom! WhiteSpeed, is the newest generation of Zoom whitening which now uses blue LED technology that emits the light spectrum to accelerate and help enhance whitening results with no compromise to safety. Older versions of lighted whitening, like those we see in mall kiosks, emit UV light rays that cause desiccation-the drying out of the tooth, which is dangerous to the enamel and dentin, causing severe sensitivity. 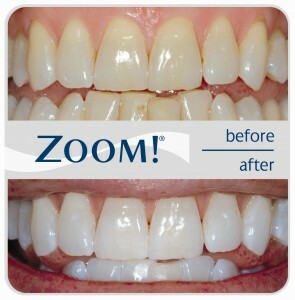 This new, safer version of whitening technology is ideal for anyone looking for immediate results. The results of the in-office whitening are dramatic! When paired with take home trays for additional whitening, your smile will be transformed from stained and dark to white and bright, making you look and feel younger and more attractive. Call us to schedule your appointment with one of our hygienists, your teeth will be whiter in just under 90 minutes!